OPPORTUNITY - The rovers are also able to take microscopic images – and this picture of some unusual spheres in some layered rocks was an early and strong indication Oppy's turf was once a warm, wet place. Spheres like that are telltale signs water was present when the rocks formed. It is one of many pieces of solid evidence gathered by the rovers that there was once a lot water here – a long, long time ago. 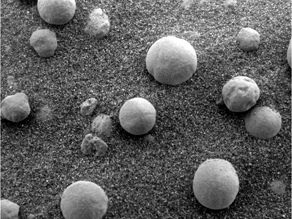 The science team called the spheres blueberries – but they don't look very tasty to me. Join Miles this Sunday at 7pm Eastern for an hour-long special on the next Mars landing. The Phoenix Mars lander is scheduled to touch down on the Martian surface during the hour.